I think it will still be intense though, even though it is short. The change in rotation is not unlike an RMC stall and a lot of us are fans of those. Under different circumstances I bet this new inversion would flow well, but I think it's dive loop into the brakes that hinders it. People don't like Zero G Stalls because of the rotation, they like them because of the incredible floater they offer whilst you'e inverted. I mean, it's pretty much a Sky Rocket on Steroids. Which, is fine I guess? Everyone loves these, and this one is all about the launch anyway. It definitely feels more "mature" than most of the Intamin hydraulic launchers (which is not necessarily a compliment, but it's something) and I feel like the disappointment is coming from Six Flags announcing this as a full-fledged major coaster rather than the 20 second ride that it actually is (Busch Gardens has done this much better, with Tigris just being the cherry on top of a bigger cake), but then again, I don't feel like enthusiasts can really consider themselves being fooled as everyone knows about the kind of budget Six Flags is making these additions on. Okay, I'm not a native speaker so I don't mean that in the douchy way it sounded like, but I hope you get my point. Hoping for bigger is always justified, but I wouldn't say Six Flags has made false promises about Maxx Force. 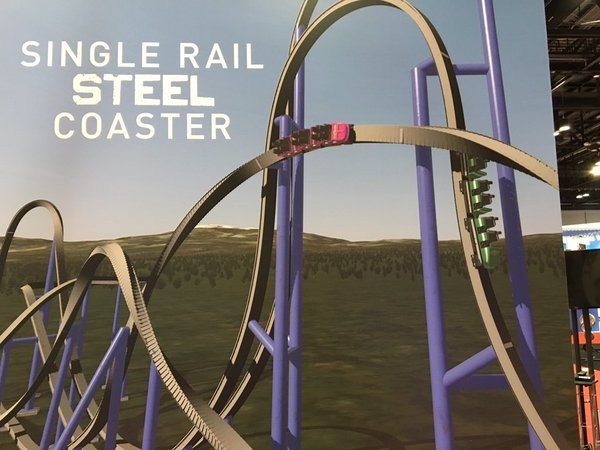 If anything, I would be annoyed about how this won't be a crowd eater rather than it won't being a world-class coaster because Great America is more needing of those than of record-beaters. 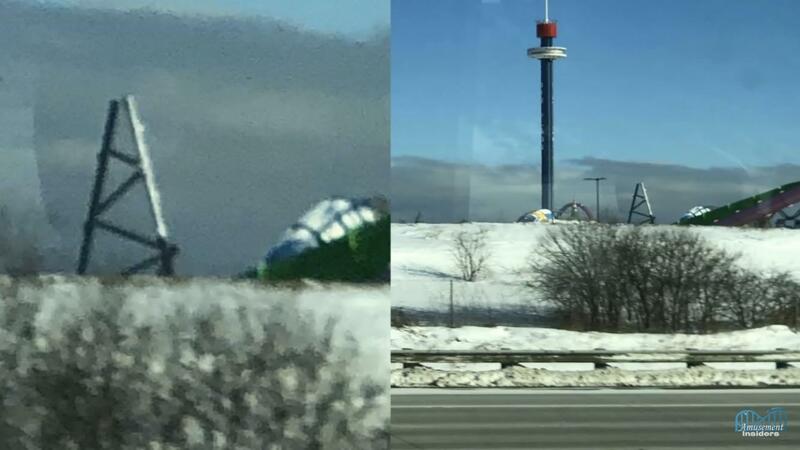 If this ride ends up attracting more visitors than it can serve, it might even turn out to be a downgrade for the park in terms of visitor experience. As I said, Sky Rocket on steroids. Its a short Power Ride. they have enough of long rides, its fits Perfectly in the Lineup. It's on par with ride times of Intamin Accelerator coasters (e.g. Storm Runner ~30 seconds), so I think it fits with the rest of the pack on layout and design. I'm pretty excited for these element designs, as they're definitely unique and novel! Jackson, Matt N and GuyWithAStick like this. They're really working now! 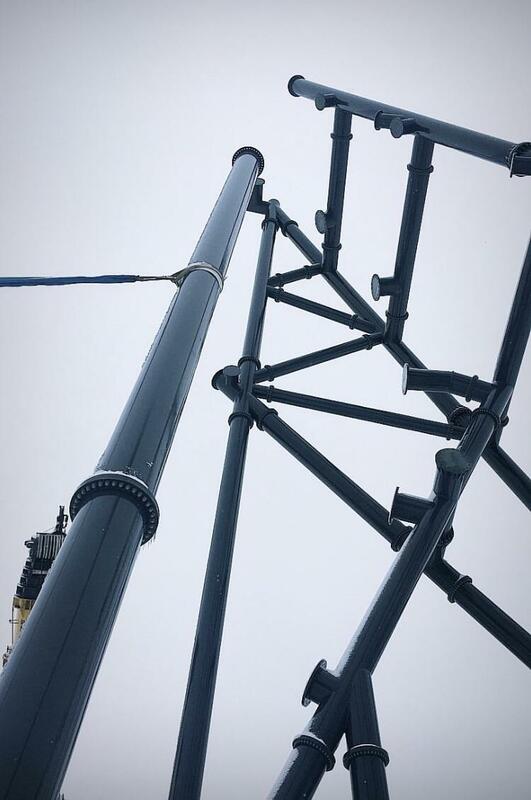 Soon enough we'll be seeing track going up. Matt N, CrashCoaster and Pear like this. Looks like on pace for mid July opening! Right on Six Flags time! To be fair, I reckon this could open by the end of May or the start of June if past Six Flags openings are anything to go by! 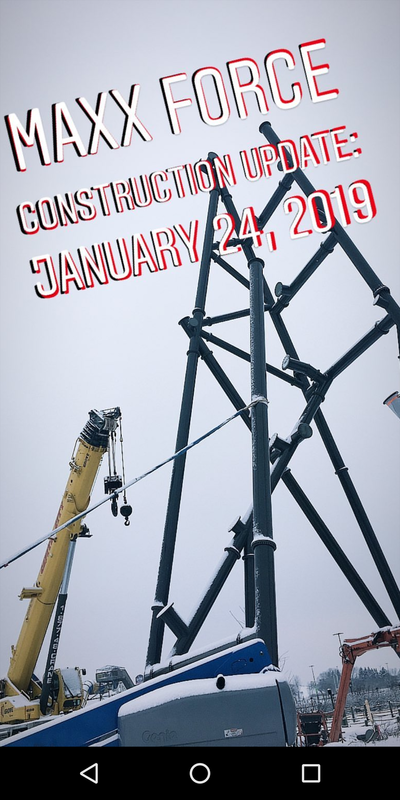 It's certainly the furthest along of Six Flags' 2019 coaster projects! That's taking off a bit quicker than Steel Drapes did! Is that the structure for the final inversion? Well, Maxx Force is now forever Maxi Big da Force to me. Thanks for that Howie. No, seriously, thank you for that. b&mfanboy123, CrashCoaster, CoasterEv and 1 other person like this. The colour scheme? It really reminds me of Ring Racer. Particularly with the way both creds end prematurely. They launch out, do a few turns and inversions, and as they get going they just...end. Both of them see like they could've added a little more at the end. I think Maxx Force will flow a little better than Full Throttle though. Here there isn't any stop in the middle that breaks up the pace.